Stunning Beach Home. Glass Balcony with Fire Pit. Steps from the Sand! This spacious luxury split level with 3 bedroom/3 bath home provides all the comforts of being home with a relaxing vacation atmosphere that will capture your senses and having you wanting more! Full size washer and dryer located in the garage. Kitchen has stainless steel appliances, granite counter tops, and hardwood floors. We provide bikes, boogie boards, sand toys, and beach chairs for all to use. This bay home is only 3 houses away from the beautiful Mission Bay sands and steps to the beach. This home is gorgeous for many reasons, but the views all speak for themselves. 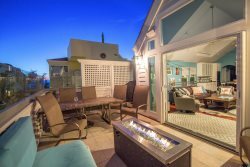 The upper level deck invites you to watch the stunning sunrise on the bay where you can enjoy fun filled family/friend BBQ, or watch the breath taking sunsets on the beach.